Gene Simmons was presented with the ‘Golden God’ award at the Revolver Golden Gods awards, which aired on April 11 via webcast. 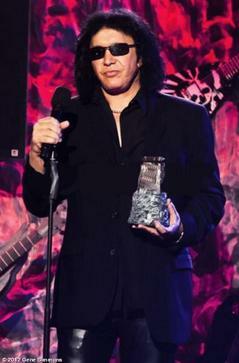 Simmons received the award from Nikki Sixx of Motley Crue, who himself had just won the Best Bassist honor. During his introductory speech, Sixx revealed he once slept on the streets of Seattle as a youngster in order to see KISS perform. He won’t have to go to such lengths to witness the Demon in action when the two bands embark on perhaps the summer’s most anticipated tour this summer. 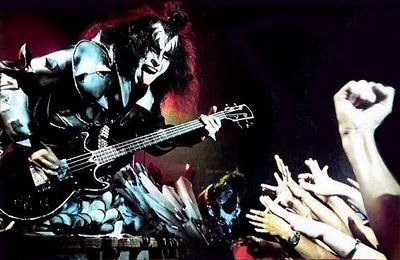 Gene rulez! Thanks for the upload from the awards cool too see! Great blog btw! Check out my blog if you want to see KISS zin fire wine and KISS Destroyer beer amongs many other cool videos and bands.